Manager Dave Roberts said Wednesday that the Dodgers' plan is for Urias to be built up as a starter in 2019, Bob Nightengale of USA TODAY Sports reports. This piece of information doesn't come as a surprise but it's encouraging for the 22-year-old's fantasy prospects heading into next season. Urias spent a majority of the 2018 campaign on the disabled list while recovering from shoulder surgery and has exclusively been utilized as a reliever since returning to game action in late July. 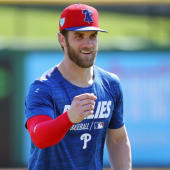 Prior to the injury he started five big-league games in 2017 and 15 the year before. At this point it's unclear whether Urias would begin next season in the majors or start the year in Triple-A Oklahoma City's rotation. His status will be worth monitoring throughout spring training.